These quarterbacks have started for the National Football League's Houston Texans. They are listed in order of the date of each player's first start at quarterback for the Texans. 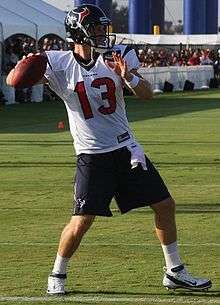 Due to injury to both starting quarterback Matt Schaub and backup quarterback Matt Leinart during the 2011 regular season, T.J. Yates became the starter for the rest of the season as well as the playoffs. These quarterbacks have the most starts for the Texans in regular season games. ↑ "2016 Houston Texans Statistics & Players". Pro Football Reference. Sports Reference LLC. Retrieved 2014-12-20. ↑ "2015 Houston Texans Statistics & Players". Pro Football Reference. Sports Reference LLC. Retrieved 2014-12-20. ↑ "2014 Houston Texans Statistics & Players". Pro Football Reference. Sports Reference LLC. Retrieved 2014-12-20. ↑ "2013 Houston Texans Statistics & Players". Pro Football Reference. Sports Reference LLC. Retrieved 2014-12-20. ↑ "2012 Houston Texans Statistics & Players". Pro Football Reference. Sports Reference LLC. Retrieved 2012-10-02. 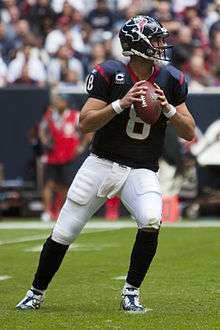 ↑ "2011 Houston Texans Statistics & Players". Pro Football Reference. Sports Reference LLC. Retrieved 2011-09-11. ↑ "2010 Houston Texans Statistics & Players". Pro Football Reference. Sports Reference LLC. Retrieved 2010-11-28. ↑ "2009 Houston Texans Statistics & Players". Pro Football Reference. Sports Reference LLC. Retrieved 2010-11-28. ↑ "2008 Houston Texans Statistics & Players". Pro Football Reference. Sports Reference LLC. Retrieved 2010-11-28. ↑ "2007 Houston Texans Statistics & Players". Pro Football Reference. Sports Reference LLC. Retrieved 2010-11-28. ↑ "2006 Houston Texans Statistics & Players". Pro Football Reference. Sports Reference LLC. Retrieved 2010-11-28. ↑ "2005 Houston Texans Statistics & Players". Pro Football Reference. Sports Reference LLC. Retrieved 2010-11-28. ↑ "2004 Houston Texans Statistics & Players". Pro Football Reference. Sports Reference LLC. Retrieved 2010-11-28. ↑ "2003 Houston Texans Statistics & Players". Pro Football Reference. Sports Reference LLC. Retrieved 2010-11-28. ↑ "2002 Houston Texans Statistics & Players". Pro Football Reference. Sports Reference LLC. Retrieved 2010-11-28.